Order in 12 Hours 39 minutes 40 seconds for dispatch today! The Extreme Smock has become a modern outdoor classic. The first truly technical softshell, single layer mountain smock. Designed and built without compromise. Tested in extreme and hostile conditions for 20 years by mountaineers, climbers and on multiple high Arctic and Antarctic expeditions, both the Extreme Smock and Extreme Jacket have become trusted favourites of Mountain Rescue teams and outdoor professionals across the world. Just test-driven this smock in wild conditions in the Cairngorms (40MPH wind, wind-chill -17C) and it really stood up well, worn over a Helly Hansen Lifa base layer and a lightweight wool mid-layer. Good close fit and excellent, thickly insulated hood and neck flap. Loads of room in the kangaroo pocket for map case, phone, gloves, goggles and there is a cosy microfleece handwarmer behind that. Side zips allow effective venting on the walk in and velcro tabs allow you to cinch in the hem when you need to. No internal pockets and the sleeve pocket is too small to be practical, but overall I'm very satisfied with this for cold weather walking. This is my second Montane extreme smock. (I've gone up a size). 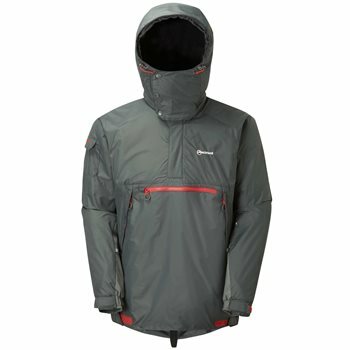 Excellent value, hood is included, and the ultimate cover for bitter cold or windy weather. Improved version too. Wear next to skin or over light base layer.